Last year, Netflix ushered in the rom-com revival with their “summer of love”. This year, they’re keeping the love train running with a new romantic comedy, Someone Great. It stars Gina Rodriguez and LaKeith Stanfield as a twenty-something couple splitting up on the eve of their thirties. But as intensely hot as the way they look at each other is—and it is VERY HOT INDEED—the real romance here seems to be between Gina Rodriguez and her friends (played by DeWanda Wise and Brittany Snow). Like Late Night, where the romance is between women who work together, Someone Great seems to say, Yeah romance is cool but also loving your friends is cool, too. Someone Great is written and directed by Jennifer Kaytin Robinson. It’s her directorial debut. She made a movie about a diverse group of young women hanging out and supporting one another through life changes that looks fun and funny, and where is that movie being released? On Netflix. You may have heard that Steven Spielberg doesn’t think Netflix movies should count as “cinema” and wants them banned from the Oscars. In the long run, he’s not going to win this fight, because he is one of the last people not in business with Netflix and his peers aren’t going to want their work on that platform discredited from Oscar competition. But in the short term, I wish he could see that Netflix, and other streaming platforms, are supporting the kinds movies that studios don’t make anymore. As Ava DuVernay pointed out, her film that got the widest international distribution was her Netflix documentary, not her studio efforts. It would be one thing if Spielberg was out here agitating to support more inclusive work at the studios, and that they make more mid-budget movies like romantic comedies. But he isn’t. He’s not trying to increase access and opportunity at all, he’s just trying to shut down the thing that sprouted up to do the work studios stopped doing. This doesn’t make Netflix a hero—they’re a corporation so they’re automatically disqualified from hero status—but they are offering opportunities to women and people of color that the studios are not as widely embracing. Someone Great is the work of women. If Steven Spielberg gets his way, this won’t count as a movie. So what will he do to support women making movies? Anything? Nothing? 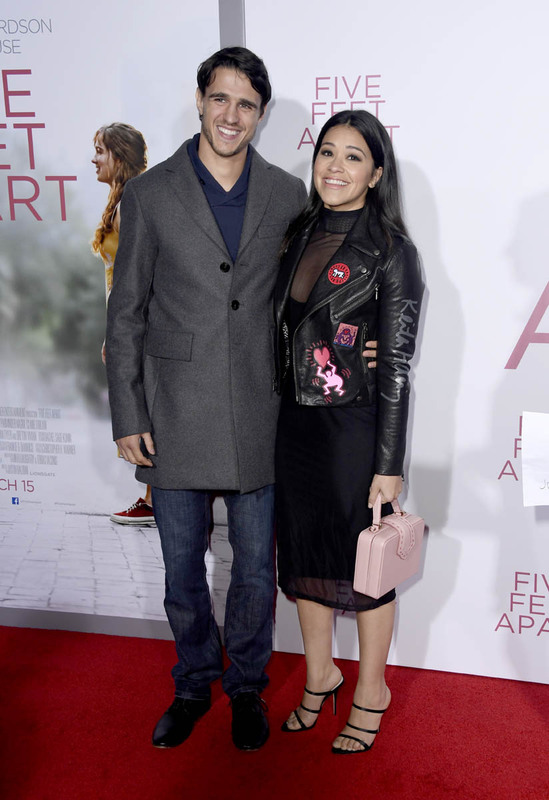 Attached - Gina at the Five Feet Apart premiere last night with fiancee Joe Locicero.